If you’re following me on Pinterest you may have predicted that this would be one of my next DIY projects. But first let’s have a glimpse into the bedroom which got – after the retro style dresser and an upholstered chair – a new piece of furniture: a clothes rack. 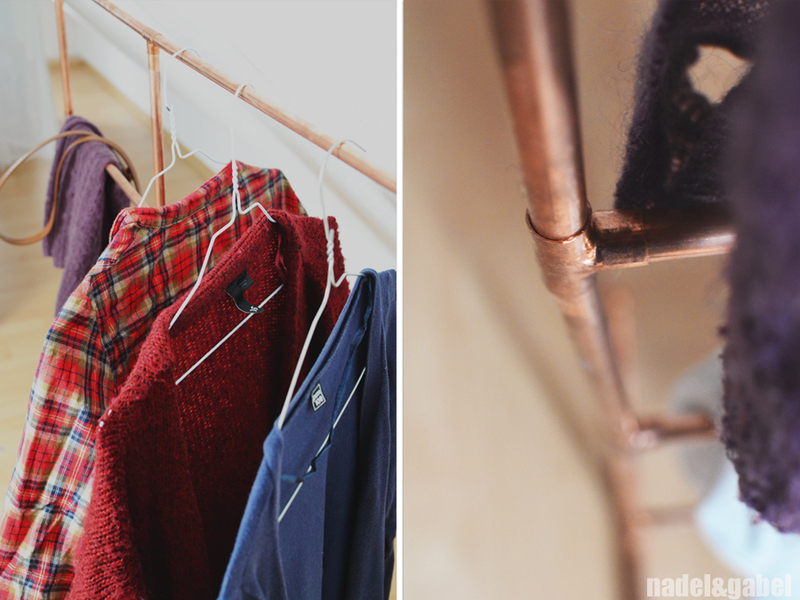 Of course you all know: copper is the new … whatever! And pipes! 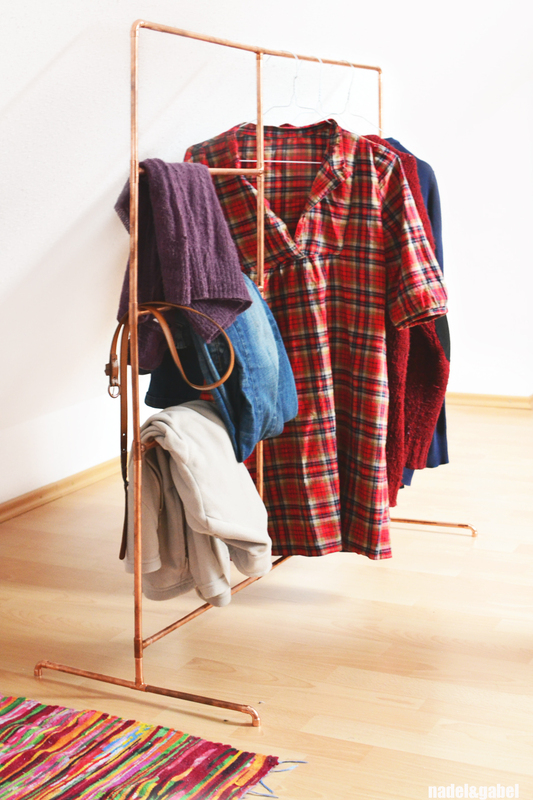 I fell for everything made of pipes (steel or copper) from the first time I saw the first piece – especially for those minimalist industrial style clothes/coat racks. After doing some research, I finally came to the opinion that this would be a really easy-peasy DIY project with an impressing outcome. Perhaps it is … if you are a regular visitor to the hardware store. I am not. 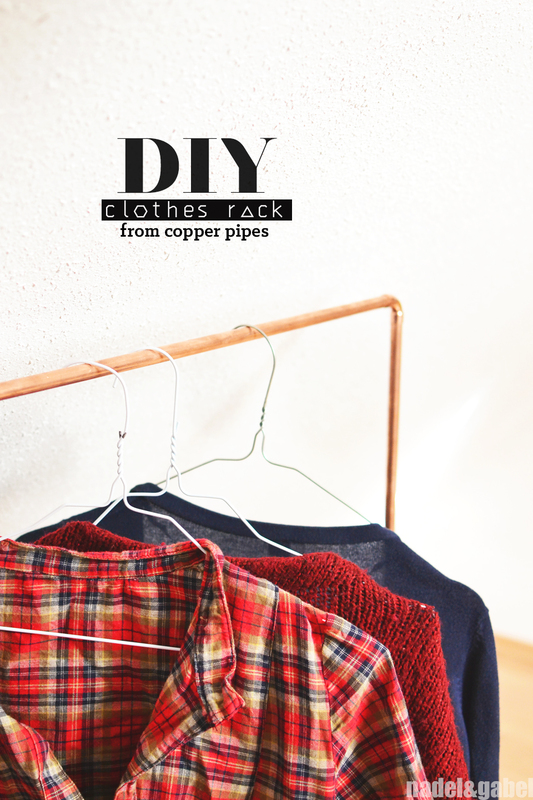 So I had to overcome a few obstacles, make daily visits to the hardware store until I finally could hang my first clothes on the rack. First I learned that perhaps other hardware shop do cut the pipe into pieces for you – the two I visited didn’t. So now we’re proud owners of a metal saw. In the end the sawing wasn’t that big deal (besides a blister on my finger). Second I had to find my way through various kinds of fittings. I never found out how the screw fittings should work. 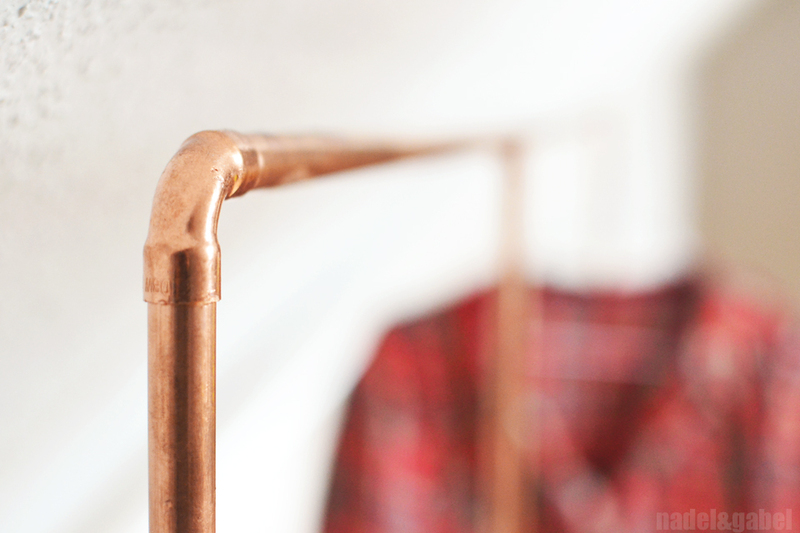 And all I could see on pictures of other copper pipe racks were normal fittings. So I bought them. I read that you only have to stick them together. I learned that this is not the case – that instead the’re meant to be fixed by brazing. Me? Brazing? – This was the point where I was so close to give up. … when I read (here) that it could indeed work what I had thought in my dilettantish way from the beginning: just glue the pieces together. Of course not with normal glue but epoxy adhesive (you get it at the hardware store as well). I was quite respectful and careful using this glue (having all those warning notices on the package) and I have to say that it smelled really horrible, but – and thats what counts in the end – the pipes hold! The good thing: As soon as you got through it, you forget about all the trouble you’ve had. 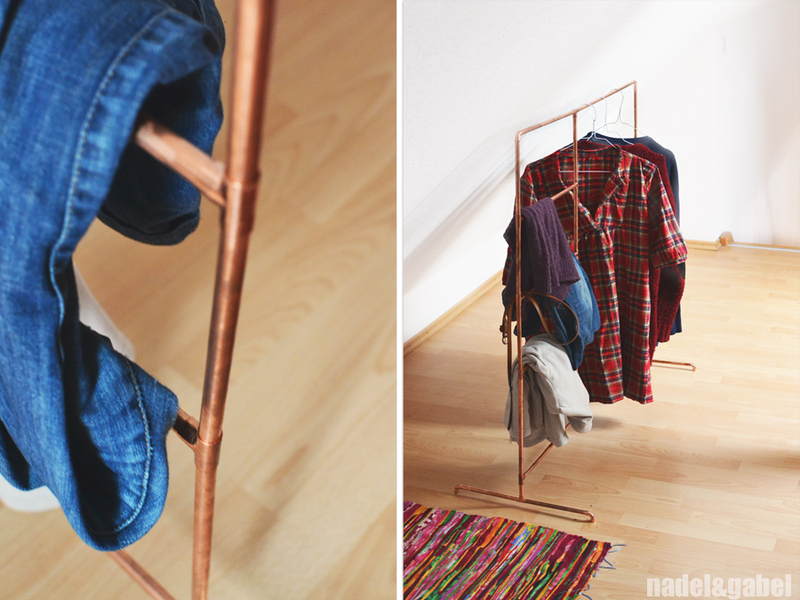 Now I just love it – the clothes rack I MADE! Some words about dimensions: I adjusted the height of the rack to 1. the length of a regular shirt of him/my tunics and 2. to the pich of the roof of our bedroom. The final size therefore became 1 m x 1 m.
Instead of most racks I had seen I added a kind of ladder part – additionally to the simple rack that you can use with hangers. Rough the ends of the pipe pieces with sand paper. Glue and stick pipe pieces and fittings together (Follow the istructions on the package). Let glue dry over night. I know: You’ll say now: “That sounds easy!” – Yes, actually it is! By the way: The checked tunic you can see on the rack is made from the Tova pattern. I sewed it quite a while ago (and two more in the meantime) and just missed the point to post it 😉 But I am wearing it so often! I really love it! Could you I make this in a larger scale for curtains to separate a half-wall, upstairs loft?